Small stela with images of Ptah and Sekhmet decorated in incised relief with traces of blue pigment. The surface of the stela is badly pitted, especially in the center. Ptah stands at the left, facing right. He has a tassel at the back of his neck, and holds a was scepter. He lacks an incised ground-line and does not have a shrine. 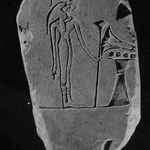 On the right side of the stela is an image of the lioness-headed Sekhmet, who faces left. She wears a uraeus and holds a badly damaged scepter. There is an offering table between the two gods.